All things Science Fiction (TV, books and even games). Starhunter, Firefly’s little known older cousin. 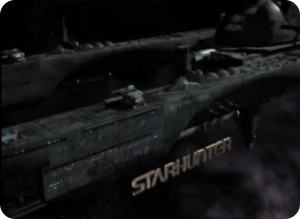 I have recently been watching and really enjoying a little known series called Starhunter. At first I thought it was an enjoyable rip off of Firefly, so i was surprised to find out that it was made first. It has so many of the same elements, the quirky ship mechanic, the captain who doesn’t play by the rules with a darker background, raiders, etc. I have no doubt that Joss Whedon stole many the ideas for Firefly from this series and in the process improving on them in many ways. Sadly, like Firefly this series was canceled way before it reached a wide audience. You can watch the “second season” (Starhunter 2300), which is closer to a spin off rather then a second season (most of the characters have changed), on Youtube. I would highly recommend people who enjoyed Firefly check it out. Since its free, what have you got to loose? While the first season is available on Joost, it is apparently horrible mangled. Sadly, the DVD’s are not available here in Australia so I’m going I’m going to have to buy them from Amazon.